Imagine if we ditched the diets, cleanse rushes, emotional eating and just simply focused on little simple things we can do for our health everyday. Sounds nice doesn’t it, well if we did that we’d achieve how we desire to feel. That’s why I don’t recommend diets, you can learn all about why and how not to need to diet in Well School. 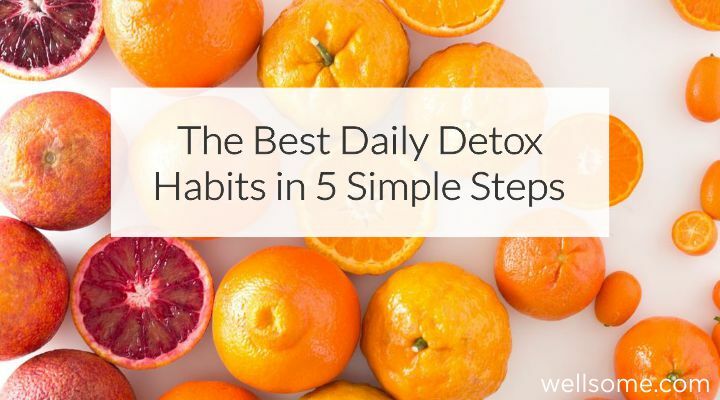 But I want you to get started with 5 simple daily detox habits today. Stay Hydrated. It’s easy to miss this one, forget it or just not do it. What is vitally important for many, if not every single process in the body and when we deprive ourselves of it we just feel yuck and don’t realise what water could be the fix. Sounds simple but it is so believe it. Drinking water improves the function of our elimination system, aka get those toxins out. It nourishes our liver, colon and entire digestive tract. Basically you’re go to toxin mover is water. Download my Wellness Guide – 7 Principles to Simple Daily Health to learn how I get my full water intake in every day, easily. Get Moving. When we’ve indulged the last thing we want to do is more, the lows that come off the back of eating out of the ordinary and on the less healthy side of the wagon leaves us just wanting to stay sluggish however… when we move our bodies we allow natural detoxification to happen through sweating, movement of toxins through organs (such as; small intestine, colon, liver and stomach), and it also gets us doing what? Drinking more water. Movement doesn’t mean a marathon run, rather go for a walk, a stretch (amazing for ringing out your digestion), dance or some yard work. Commit to at least 20mins. Just Add Lemon. If you’re a regular around here you’ll know that do talk about lemon’s a fair bit for many reasons but when it comes to detoxing daily their essential. Lemons are cheap! But most importantly your #1 detox organ LOVES LEMONS – the Liver. Lemon boosts and kickstarts your digestion and helps flush the liver. Simply add freshly squeezed lemon to your water in the morning, over salad or on a roast There’s many ways we can add lemon so don’t get caught up in how you do it, just remember to do it at any time of the day. Tongue Scrap + Dry Body Brush. You may have heard of these two things before as they’ve been around for centuries. Tongue scrapping is amazing as it helps us detox from the mouth (morning and night) to remove toxins that have built up on the tongue overnight or during the day. Do this after you brush your teeth morning and night. Dry brushing works in a different way. By taking a body brush and brushing it along your body towards your heart you’re activating your lymphatic system and boosting your circulation. Two super important parts of detoxing. Do this all over your body for approximately 5mins and then jump in the shower. Eat (or drink ) Yo Greens. Goes without saying right. However specifically for detoxing green is your go to colour. Green vegetables and fruits are highly alkaline, which supports the bodies processes of rebalancing, plus if gives your body a support good hit of vitamins and minerals. Make you’re favourite green smoothie, salad, roast or stir fry. Grab food ideas of what I eat and how I get my greens over in our Free Community. My 5-week online Group Coaching Program is filled with detoxify steps, in week 3 we spend the entire week focused on the rebalancing & detoxification steps to achieving your optimal daily flow. Join us for our next round in just a few weeks and sign up today to start your own detox journey with me here, click here to learn out more.